San Diego Comic-Con is one of the biggest pop culture events of the year, but it's only a few crazy days long. 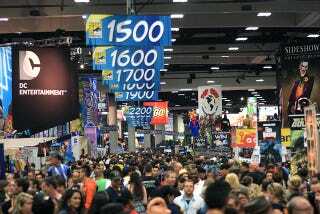 That might be changing thanks to a new partnership between Comic-Con and Lionsgate, which wants to build a video-based subscription service to turn the event into a "year-wide celebration." The new service will launch with a broad portfolio of content including original short-form content created exclusively for the channel’s subscribers, films and television series from Lionsgate and other studios designed to appeal to the diverse interests of Comic-Con’s fan base as well as exclusive archived footage from Comic-Con’s 45-year history. As part of the new channel, the two companies will also work closely to make the Comic-Con International Independent Film Festival (CCI-IFF) a 365-day-a-year online event. So what is the exclusive content going to be? The idea of it being short form sounds like it could be interviews rather than panels from the cons. While it's unlikely that the plethora of Con-exclusive trailers or sneak peeks would ever be made available outside of attendees actually at panels, maybe the service will allow people unable to attend to at least see some of the stuff going on at the show. Maybe not live and as it happens — after all, there has to be an incentive for people to go, after all — but maybe archived after the fact. That could be pretty cool. But will the subscription service be worth it if it doesn't offer actual breaking Comic-Con news and event coverage? There's no details about pricing tiers just yet, but the service is due to launch in the nebulous time frame of "later this year" — which sounds an awful lot like it might miss this year's installment in July.